In the good old days the sport of table tennis was a hive of activity with several clubs being formed, including the YMCA, YMBA, Municipal Community Centres, Bonjean TT Club, Young Enthusiast TT Club and schools giving to the game many brilliant individual, doubles players, mixed doubles players and champion teams. Kotahena, in Colombo 13, I remember as a schoolboy at St. Benedict’s College, was a hub and a hive of table tennis activity with many homes too having table tennis tables. While TT was largely played for the simple joy and thrill of the game, Sri Lanka produced some unsung heroes who deservedly rose to the 'Legends Hall of Fame,’ ANGELO SANTIAGO a national and a player of international class emerged from St. Benedict’s College, Kotahena. St. Benedict’s College gave the country its first national captain in Cosmas Mahagama Perera. He had no peer as an all court basketballer in the country. The next captain SBC gave to the country was ANGELO SANTIAGO who was a table tennis ace par excellence. He captained the country in the Asian Championships held in Malaysia in 1979 and then again in the one hosted by Pakistan in 1984. A truly remarkable feat by any standards. But what the unassuming SANTIAGO now domiciled in Canada must still be reminiscing and still celebrating must be the set he took off the then China’s World Champion Li-Chang Kuang in the Asian Championships in China in 1971 while still in his teens. He repeated this feat again when he took a set off the Japanese World Champion Ohono in the 1979 Asian Championship held in Malaysia. SANTIAGO was a great draw where ever he faced the tables. His fans would cheer ‘GO SANTIAGO GO’. And he obliged his legion of fans playing some wonderful ping pong and he earned loud applause for the wonderful strokes he put on show to bemuse his opponents. It was also a remarkable achievement to win the men’s national title in 1971, ’74’, ‘78, ’85 and 86. SANTIAGO’S dominance was such that he represented the country in 24 foreign tournaments since 1969 and his performances were such that local and foreign newspapers, unlike today where hardly any prominence is given to TT gave SANTIAGO rave headlines. SANTIAGO also had the good fortune of being selected to follow a four-month Diploma Course in China which helped him to further sharpen his skills in the game and gain the necessary confidence to quench his thirst for more titles. In 1971, ’79 and ’84 SANTIAGO who was recognized as the Emerging Best Player in Sri Lanka and he was the recipient of an award at the Asian Championship. His talent also won for him a two-week coaching stint under the six time Indian national champion Gautam Divan who was in Sri Lanka at the invitation of Charlie Daniel the inimitable who did wonders for the game here during his reign. SANTIAGO’S talent that was closely watched by another Indian star, veteran player and ITTF official C.T Dorairaj was quick to shower praise on the young SANTIAGO for his potential with the racquet in his hand. The young man also left his mark at the Afro Asian Latin American Championships in China, Nigeria and South Korea. It would be nice to reminisce and recall the tributes SANTIAGO paid to Justice A.Vytialingam, M.Balaji, Chandrakant Vasa, Eric Motha, Lucian Alles and P.V. Gopalakrishnan former TT stalwarts that the country will never ever see again for helping him in his early years. Incidentally Eric’s brother Anton too was champion TT material. Incidentally SANTIAGO comes from sporting stock. The writer wishes to go down memory lane and visit the generally loved and called era the sexty sixties when ages of personalities are spoken of. A family that made table tennis famous and popular not only in Kotahena but in the country were the Ratnayake sisters who were students of Good Shepherd Convent, Kotahena– Frances, Leonie and Nimal. Frances was the most outstanding being national champion for many years and also representing the country. 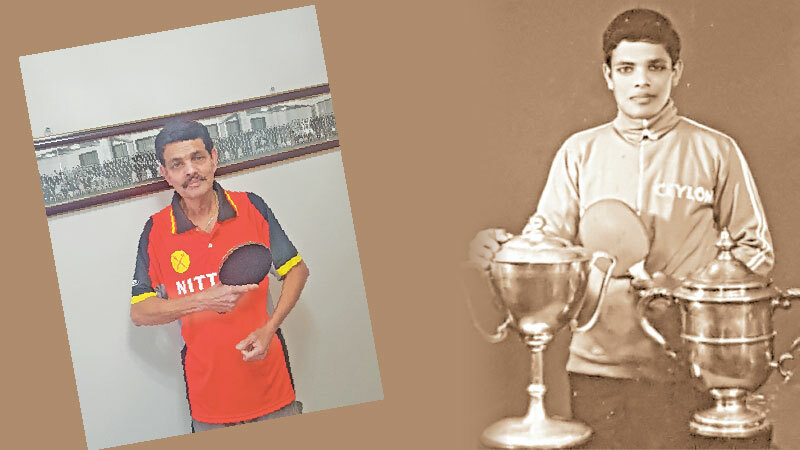 In fact the Ratnayakes formed a club of their own which they called the Bonjean Table Tennis Club and in addition to the Ratnayake family many other promising table tennis players joined the club and it was a club most feared by other clubs. But back to ANGELO SANTIAGO. When SANTIAGO'S TT history is being written it would not be complete if reference is not made to his two uncles Sampoornam and Nithy. The uncles were also Benedictines and were famous for their dribbling prowess at football as schoolboys and later Nithy for the Old Bens, Kotahena Rangers, Police and the country. In those days when inter-school football was at its best and fiercely contested for, Sampoornam and Nithy used to attract a full house of spectators. They were star attractions for their magical dribbling skills. The duo once they had the ball at their feet it stayed glued like as they dribbled past the opponents, sending them the wrong way most of the time, with lovely footwork, body serves to punch holes in the defence and even at times dibbling past the goalkeepers to strike the net and win many a game for the then unbeatable Benedictines. And the player, captain of SBC who later turned coach and licked the two brothers to shape was none other than that coach of coaches B. Albert Fernando who while on a training course in Brazil trained alongside Pele, Garincha, Carlos Alberto and Santos while earning his trainer’s licence. He later obtained a German trainer’s licence too. In addition to the Ratnayake sisters who dominated TT in Kotahena, the famous Charlie Daniel who was at one time king maker of the game married Nandini a cousin of the Ratnayakes. Nandini and Charlie together they formed a formidable duo of doubles players. According to another Kotahena and Mercantile stalwart Eric Motha, Daniel had the proud record of winning the national singles title at a tender age and again aged 47, which according to Motha was incredible. One also cannot forget Anto Fernandopulle another national champion who held sway at that time.